It&apos;s more than the start of our street numbering system. It&apos;s the start of our city&apos;s story. It&apos;s impossible to find a postcard stand in Utah without a Temple Square image on one of its racks. As the most-visited destination in Utah, the dramatic spires of the Mormon Salt Lake Temple do have a prominent place in the city skyline. Of course, the landmark has major spiritual significance to the Mormon church, but the place is so peacefully beautiful - and laden with fascinating pioneer-era history - it draws countless visitors who&apos;d simply like to check it out. Just four days after arriving in the Salt Lake valley after a grueling trek carting all their supplies and belongings across the frontier, the early pioneers chose this spot to be their most significant place of worship. While they quickly erected an entire city full of buildings and homes, they meticulously planned every aspect of the temple and crafted it by hand over the course of 40 years. Before the railroad even reached Salt Lake, it was so important to them that this building be constructed as the hallmark of their faith that they chiseled rock from Little Cottonwood Canyon across the valley and hauled it in giant blocks by ox-cart, a feat of pure will. Knowing the square&apos;s draw to visitors today, the Mormon church makes the most of the chance to make them feel welcome with free tours and plenty of activities. Even if you don&apos;t participate in a formal tour, the landscaping alone is reason to stroll the grounds. The church takes immense pride in the square&apos;s impeccable flower beds, trees, fountains, reflecting pools, and lights. In fact, the universally acclaimed highlight of the year is during the holiday season, when every single branch of every single tree within the 35-acre square is covered with tiny colorful lights. The effect is one of absolute awe and reverence, whatever your background or ideology, as you walk the snowy square on a winter&apos;s night as it twinkles with holiday magic. The 35-acre square includes several major buildings today - some old, some new, and all pretty darn interesting. Here&apos;s a quick run-down of the "what" and the "why-drop-by." This place clearly holds the spotlight on the square, and for good reason. 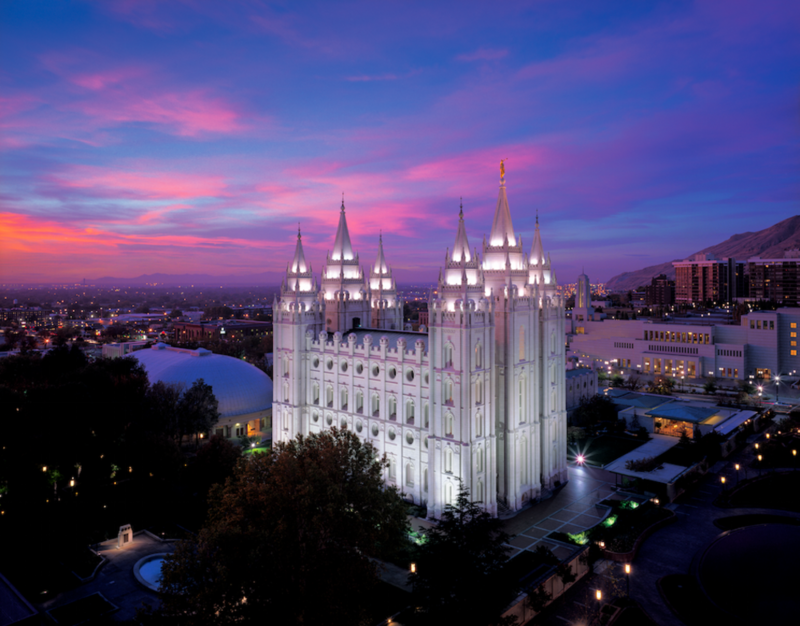 It&apos;s a spiritually important mecca for those of the Mormon faith, and as a super-sacred place, its interior is a place of worship for church members only. But you can learn a ton to learn about this incredible building from the outside. It was a true architectural achievement in its day, constructed with utter determination by people who were roughing it on the Western frontier yet wanted to build a masterpiece that would stand the test of time. Building this temple was a true act of community in which workers from all over the world who&apos;d converted to Mormonism from afar trekked to Salt Lake. They joined together and chipped in their craft to make the edifice happen. Supplies were scarce and costly, so workers went to such pains as cutting every stone block so perfectly that it would fit seamlessly with the others without any mortar. The architect, Truman Angell, envisioned a blend of Gothic and Romanesque elements, with six spires and a stately statue adorning its highest point. At the Visitor&apos;s Center you can learn everything there is to know about the building, and you&apos;ll probably walk away with an increased level of faith in what determined humans can do when they band together. Another architectural marvel in its own right, the Tabernacle is the home of the famed Mormon Tabernacle Choir. Since its completion in 1967, the hall has hosted countless performances in addition to the choir, whom you can listen to rehearsing on Thursday evenings. The building is a triumph of acoustic design, which is particularly amazing if you consider that its domed ceiling was built almost entirely without nails, which were scarce in pioneer-era Utah. Dowels, pegs, and rawhide-bound trusses created the perfectly curved roof - and thanks to it, you can hear a pin drop from 250 feet away inside the hall. The building&apos;s organ is legendary as well. It&apos;s one of the biggest organs in the world, containing 11,623 pipes. Even if you&apos;re not an organ aficionado, it&apos;s pretty easy to agree that&apos;s impressive. 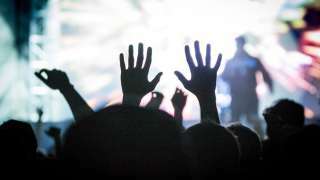 While the Tabernacle still hosts the choir and regular recitals and performances, the church eventually needed something bigger for larger events. 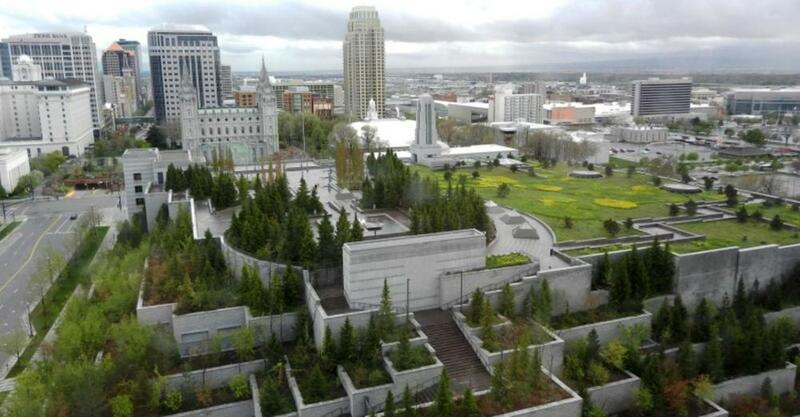 They wanted their new Conference Center to fit aesthetically with the rest of the Temple Square, so the church used the same rock that had been quarried to build the temple a century and a half before. They aimed big and designed the largest theater-style auditorium ever built. 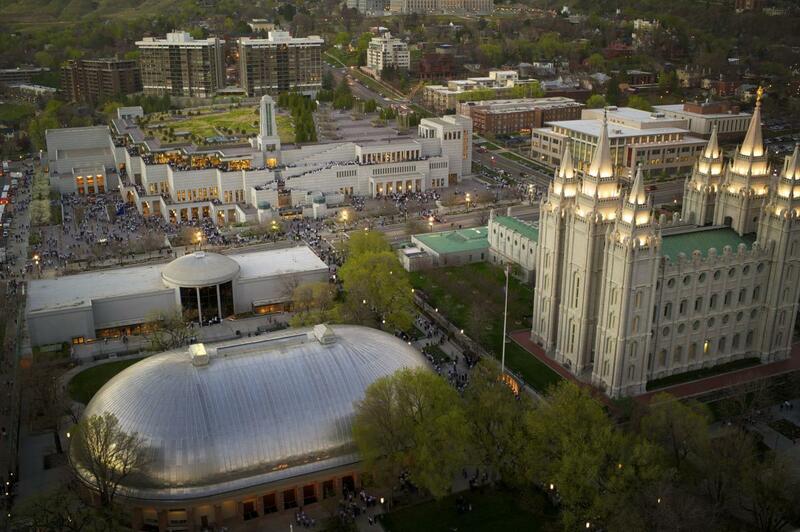 The terraced roof is exquisitely landscaped and walkable, making it an extension of the main Temple Square gardens. A waterfall babbles its way from the upper tier, joining the City Creek stream on the grounds&apos; main level. It&apos;s well worth walking around the Conference Center&apos;s interior and exterior, taking it all in. 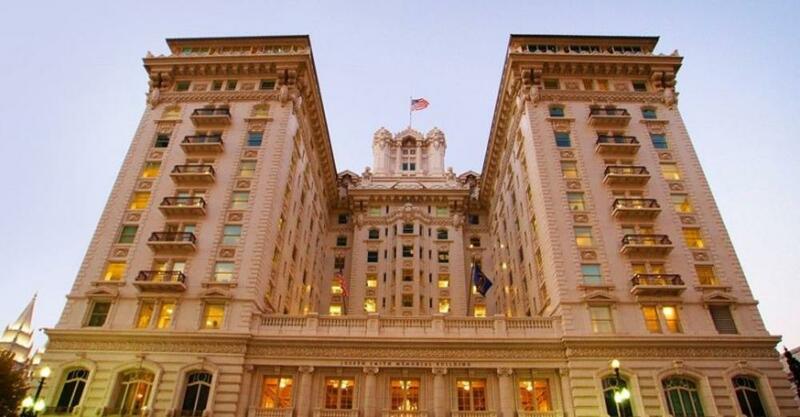 In 1911, local church and business leaders, Mormon and non-Mormon alike, decided that Salt Lake needed a first-class hotel the city could be proud of. The result: Hotel Utah, the precursor to today&apos;s Joseph Smith Memorial Building. While it served as an ornate hotel for many decades, the building today serves quite a few purposes. The elaborate decor remains, with many rooms being rentable for meetings, receptions, and banquets. 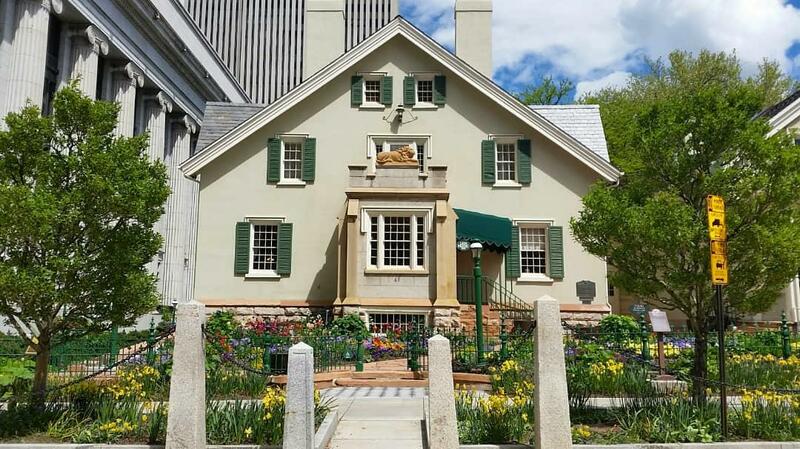 Originally home to early Mormon leader Brigham Young and his two dozen wives, the Lion House today is a historic landmark and (sorry, history buffs) even more importantly, it&apos;s home to a restaurant with the best honey-butter rolls in town. You can get a pioneer-style meal or just about any comfort foods imaginable at their family-friendly restaurant. It&apos;s frequented by quite a few workers in the downtown office buildings, who know a good smell when they sense it from ten stories above. The Mormon church takes genealogy very seriously, but even if you&apos;re not of the Mormon faith, it&apos;s incredibly cool to check out your own family lineage and learn something you&apos;d never known. 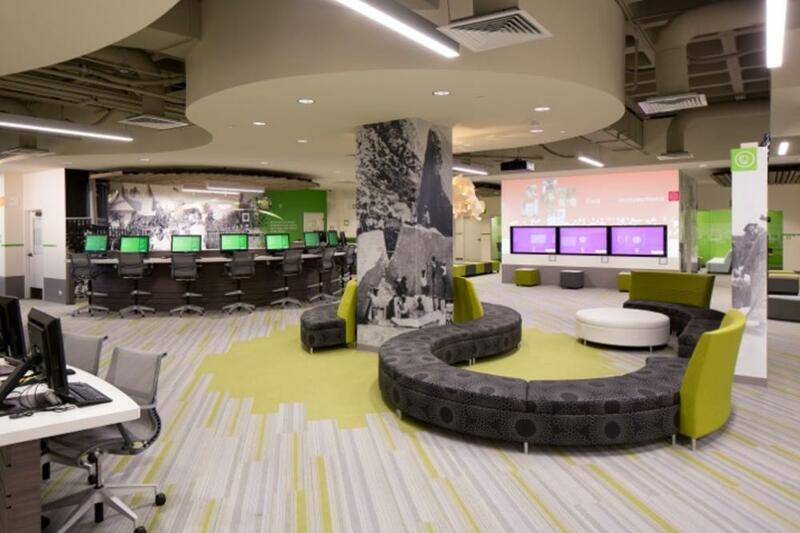 The FamilySearch Center in the Joseph Smith Memorial Building and the Family History Library are both exceptional resources, open to the public for exploration. The Family History Library sits on the western side of Temple Square, and they&apos;re a powerhouse with research and documentation of billions of our ancestors. (Yep, billions with a "B.") Just by visiting you can gain access to fascinating records, information, and activities that open new pathways up your family tree.